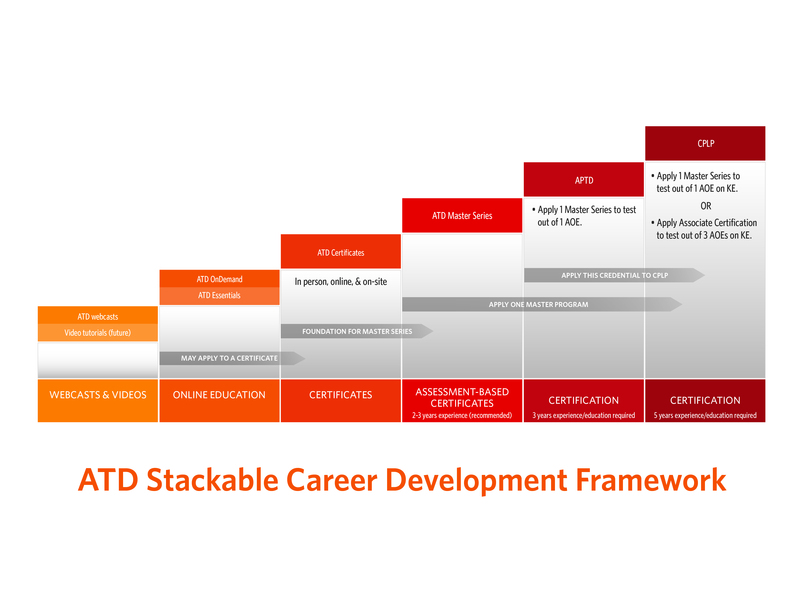 ATD's Stackable Framework allows you to combine your skills and years of experience to find the path that's right for you, saving you time and propelling your career forward. Using real-world examples and breaking out our Stackable Framework model into segments, Holly Batts, MS, CAE, PMP walks you step-by-step through how the framework works for you and how building your credentials creates a proven path to success. Watch Now: How Does It Work? Blog: Where Do You Want to Go? Our live, online workshops and on-demand modules are perfect for those looking to brush up on skills, gain focused experience in a specified talent development area, or gain knowledge by learning on their own time. Resting on a base supported by The ATD Competency Model, our on-demand courses, live-online courses, and webcasts provide an opportunity for learning and continued enrichment for professionals at all levels of their careers. These offerings are all online, eliminating the need for travel and giving you the flexibility to drop in virtually at any time, from any place. The next step in the framework is ATD Certificate programs. These are classroom-based, online, or on-site offerings that focus on comprehensive skills and concepts. Many of the certificates count toward the continuing education requirements of ATD Certifications, as well as those of SHRM and HRCI. The popular ATD Masters Series is a collection of assessment-based certificate programs focused on mastery of one area of expertise. They include a knowledge assessment and final project. Successful completion of a qualified ATD Masters program will allow you to test out of certain areas of the Associate Professional in Talent Development (APTD) exam and, coming later in 2018, the Certified Professional in Learning and Performance (CPLP) Knowledge Exam. At this point in your career, you've been around and seen some things. You're ready for the Associate Professional in Talent Development (APTD). With eligibility, assessment, and recertification, this certification proves you know your stuff! The APTD covers three primary areas of expertise from The ATD Competency Model, and can be a stepping-stone to the CPLP for some learners or a destination for others. Earning the APTD certification can significantly help early-career professionals prove their knowledge of talent development, and will enable a practitioner to test out of the three primary areas of expertise on the CPLP Knowledge Exam. You're an expert in your field and you're ready to prove it! The CPLP remains the industry’s premier talent development certification. It includes a Knowledge Exam covering all 10 areas of expertise from the competency model and an in-depth Skills Application Exam. Recertification to maintain both the CPLP and the APTD is required, and is accomplished by earning continuing education points. ATD's training model allows for flexibility and advancement at any stage and an array of industries. An ATD Masters Series Program will prepare her for the APTD and showcase her knowledge skills. Currently Beth is a Training Specialist who assists senior staff with developing and delivering training. She wants to move into a Leadership position within Training and Development. The APTD will establish credibility and distinguish himself as a trainer and leader. Mike is an EMT that spends 50% of his time creating and delivering in-service training for his entire squad. He wants to become Crew chief/Captain and ensure his team has up-to-date skills. A CPLP will help establish instant credibility and showcase her background. As an independent contractor, Pat needs a certification in order to establish instant credibility to win more TD contracts to grow her business as a Performance Consultant. ATD is here to help with every stage in your educational pursuits. Not only can you access training and certification, you can browse our extensive variety of resources for information, best practices, career and skill advice, and much more! ATD-TV Episodes, Past conference sessions, Q&As, Podcasts, Subject Experts, and more - over 1400 videos at a click. Browse 450+ webcasts and series on a variety of topics, or register for upcoming webinars. For 75 years, TD magazine has led the evolution of the profession, delivering emerging trends and proven best practices. Browse bestsellers, series, and bundles from ATD Press and SMEs on all topics. Take courses on your schedule. All the benefits of a live course, without the travel! Hands on, in-depth, and in-person. Learn more about preparing for and earning the APTD Certification. The APTD Learning System includes content and practice questions for each of the three Areas of Expertise covered by the exam. Explore the three areas of the ATD Competency Model: Instructional Design, Training Delivery, and Learning Technologies. A complete guide to APTD policies and procedures. Get all your answers to determine the value of a CPLP Certification in your success. Your guide to all things CPLP knowledge exam and skills application exam (SAE). Think you're ready? Sign up for the next testing window! Have questions, need more information, or want to explore more about the CPLP Certification? ATD is more than just education. We believe in connecting people who share your passions and interested. Explore groups, join chapters in your area, and get involved!